With the succes of its airguns, Sig Sauer decides to sell accessories for them, with this 9 center mass taspining target, recreative and efficient for training! 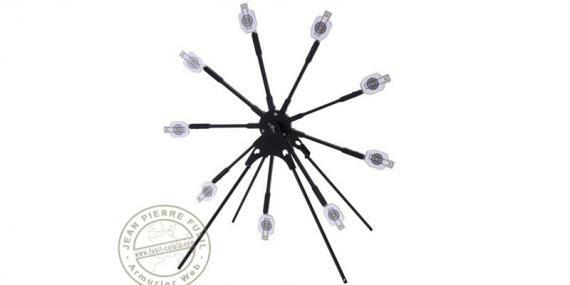 The Texas Star Spinner is made of 9 center mass targets, spinnong around a central axis. Strike any of the center mass target, to start the star spinning. As you hit each one, the wheel may speed up, slow down or even reverse direction. Made of metal, The Texas Star is strong and all weather resistant. It has quad legs for quick sturdy placement. This target is ideal for pellets (up to 27 Joule power), but not advised with BBsn that could rebound.